Keeping a basement dry is a challenge even under the best of circumstances. I’ve written many articles on how to insulate them properly to prevent mold and mildew issues. 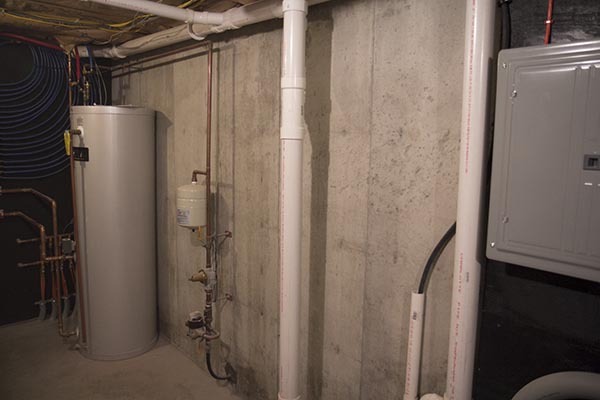 Another consideration for keeping basements dry is preventing water vapor that’s trapped inside the foundation walls from migrating into the basement. Water vapor migration from the foundation wall can drastically increase the humidity levels and create an environment ripe for mold and mildew to grow. DRYLOK® Extreme Masonry Waterproofer is a product that you can use to help reduce moisture from your foundation walls from making your basement into a humid jungle atmosphere. 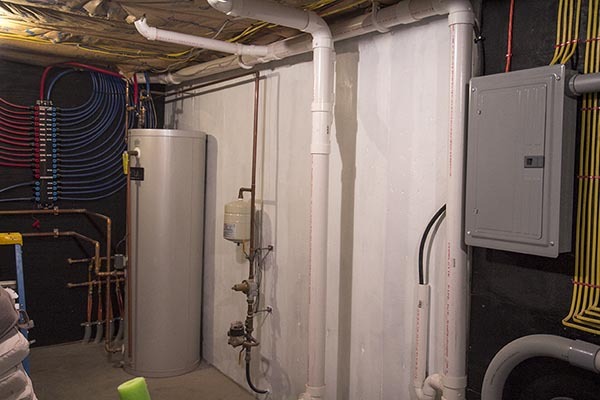 Recently I used DRYLOK® Extreme Masonry Waterproofer in the utility room of my basement. For this project I had two goals in mind including: keeping moisture and humidity levels low (the room houses our gas boiler, electrical panels, and our computer network gear) and also a brighter room. Passes ASTM D-7088 Resistance to Hydrostatic Pressure and ASTM D-6904 Resistance to Wind Driven Rain. One of the most important steps in any paint (coatings) project is surface preparation. Before applying the DRYLOK® Extreme Masonry Waterproofer on the foundation wall I thoroughly cleaned the concrete wall to remove dust, dirt and spider webs! I used a stiff broom to sweep off the bulk of the material from the wall and finished with my shop vacuum to ensure a clean starting surface. After cleaning the wall I inspected the surface to be sure all the concrete was solid and sound. If you have large cracks or holes it’s best to plug them with hydraulic cement. DRYLOK sells their own version called FAST PLUG®. Be sure to follow the manufacturers recommendations for applying the cement. Most concrete / masonry surfaces are quite porous and rough. So I highly recommend using a very stiff brush to apply DRYLOK® Extreme. I actually used brushes that DRYLOK sells which worked very well. The stiff brush allows you to easily apply the sealer and get it into all the pores. Your average concrete foundation wall may look quite smooth from a distance, but the minute you start applying any type of paint or sealer you’ll quickly realize there are many pores to fill. For this project I applied two coats of the DRYLOK® Extreme Masonry Waterproofer. Two coats did a great job covering all the small voids and pores. I did see a couple spots that needed some additional coverage after the 2nd coat so I simply coated those specific areas with some touch up. 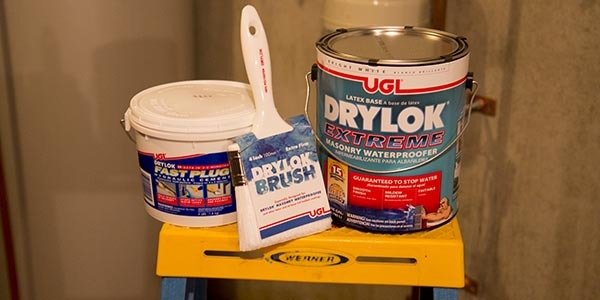 DRYLOK® Extreme Masonry Waterproofer is much thicker than traditional paint resulting in less mess, but the application is quite a bit slower in my opinion, so leave plenty of time for applying this product. Here’s To A Drier and Brighter Basement! I’m very happy with the results of the DRYLOK® Extreme Masonry Waterproofer. Now my mechanical room is definitely brighter (my plumber and electrician will appreciate that!) and the wall certainly has a robust line of defense against potentially damaging moisture in this room. This is absolutely a project any DIY’er can tackle and get excellent results. 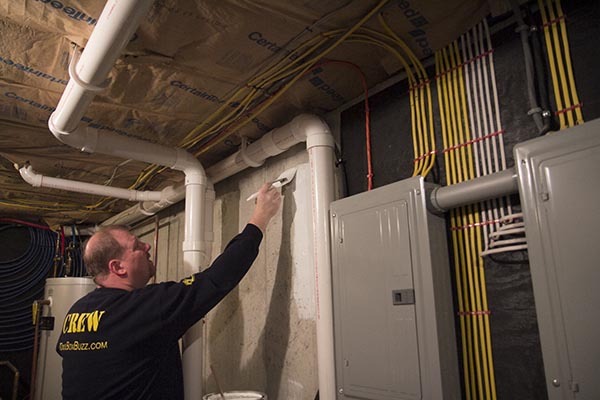 Keeping your basement dry will go a long way towards protecting your home from mold, mildew and poor air quality. Priced at my local Home Depot for $32.98 per gallon, it’s an affordable solution that’s similar in price to good quality paint. So if you’re looking to dry out that basement, spruce up a laundry room, or brighten your man cave this is a product that will certainly help that effort. I’ve had this (or something similar) on my list for quite a while. Would this be effective in controlling moisture for cinderblock garage walls? Our outside-facing garage walls are up against raised beds which bring in water when there is a heavy rain. It will help….but it’s not perfect….you need to stop the water from the outside if you really want to fix it correctly. Thank you. That’s on “the list.” In your opinion/experience, will wate seepage from rain (live in the Northeast) cause the drylok to deteriorate or break down? If so, will adding a fresh coat repair the affected area? Not sure it will deteriorate…the problem is you’re trying to stop water pressure from the inside….think of it like this…if there was a small hole in the Hoover Dam….would you plug it from the exposed face? no…the pressure would be too high. Same principal applies here. Can I glue the 8×4 foam panels to it before I build my stud walls the way you gules them on one of your other videos? Should the basement walls be painted with the drylok prior to installing the 4 X 8 sheets of the foam board or is that unnecessary? Three of the walls in my basement have never had any wet spots on the concrete block ever so I was hoping to skip painting them. The remaining wall was wet a few times due to an improper grade and shrub bed along the house and clogged gutter and these have all been corrected. It seems like this one wall could have the potential to be damp and I do plan on painting that wall. Todd-I have a few different issues going on in my crawlspace. It’s a 1928 granite rock exterior house and has open holed cinder block interior walls in the crawlspace. The HVAC system and water heater are located in there. Water heater is wrapped in insulation but all the duct work is not insulated. It’s got 2 outside vents and the ducts produce a lot of condensation. The walls also have condensation on them. I also have no ground vapor barrier. I inherited this house from my Grandmother and I don’t think she realized what was lacking. There was no door to the crawlspace, just a board leaning against it. I built and framed in a door, which helped seal it a little better. I’ve already installed gutters and attached drains to the downspouts to move water away from foundation. The East wall was getting water inside the crawlspace, so I dug down to the footer and installed Black Jack tar on the outside wall and a 6 mil poly under a perforated drain line, wrapped in material with gravel. I had 2 truck loads of dirt brought in to slope dirt away from house to help with drainage. My question is, where do I begin? I thought if I first wrap insulation around duct (not sure which kind of insulation) as the humidity is high, then see if it dries out at all. Not sure if capillary suction is causing walls to weep or it’s the HVAC. Any thoughts would be greatly appreciated. Sorry such a long read. I wanted you to give you all the information I had. Carl – Definitely need to get that duct work insulated and sealed properly. Most of the foil covered duct insulation should be fine for that, before installing it I’d use mastic to seal all the joints really well. You’re definitely going to want to seal that dirt floor as well. Todd, I am a little confused. One of the product features is “Breathable film – does not trap moisture in masonry” Does this mean that it won’t stop water vapor migration?